I guess it’s this cold, frigid, brutal and gray weather that just DEMANDS this kind of meal. I have been dreaming of eating cholent for three days now. Yesterday, I picked up all the ingredients and this morning I prepped the stuff and threw it in the oven. For those who are unfamiliar with this dish, Cholent (pronounced choont) is a very traditional Jewish meal. 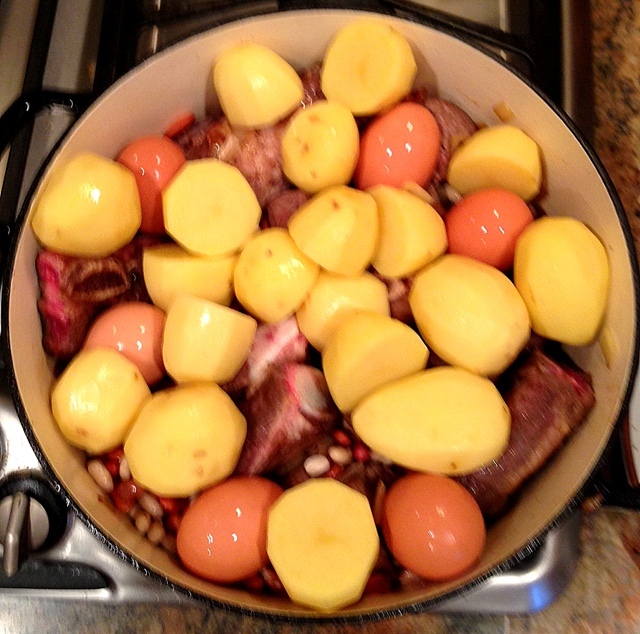 Usually prepared for the Shabbat lunch, it is a slow cooked stew made up of meat, potatoes, onions, beans, barley and eggs. Observant Jews would boil the stew on Friday night and place it in a low temp oven overnight until they served it for lunch the next day. I can just see the peasants of the Eastern European shtetls warming up around a hot pot of Cholent from the winters of Russia, Poland, Czechoslovakia, etc. For me, this is just my most favorite meal. My mother makes one helluva cholent. When I say the word, it conjures up warm family nights, sitting around the table, eating serving upon serving of cholent. She used to make me a giant pot at the end of winter break from college so I would have enough for a week of deliciousness at school. Even the famous poet Heinrich Heine wrote lovingly of Cholent (to which he refers as schalet) in his poem “Princess Shabbat” (“she” refers to Shabbat). For today the Sabbath is. Thou shalt eat today some Schalet! Had he ever tasted Schalet. Publish’d in a storm of lightning. Was but wretched devil’s dung. Now you see, cholent is no simple stew. It literally envelopes you with warmth. So, if you’re looking for a great way to beat this nasty weather, I am giving you my recipe. Stay warm! Salt and pepper all the meat on both sides. In a large (8 or 9 qt.) 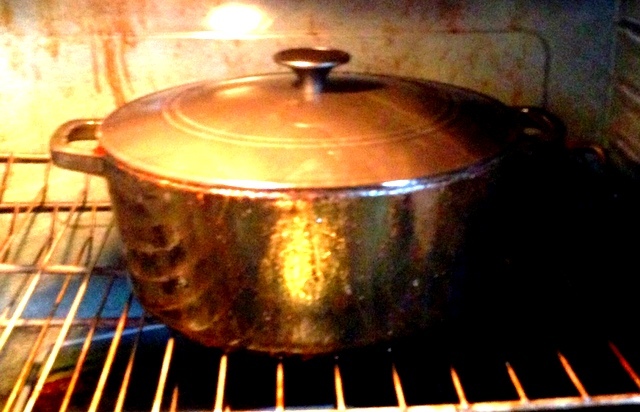 heavy Dutch oven, coat the bottom with olive oil and heat. Brown the meat on all sides. Remove from heat and set aside. Leave the leftover fat, oil and brown bits. Saute the onions in the fat until caramelized (about 5 minutes). 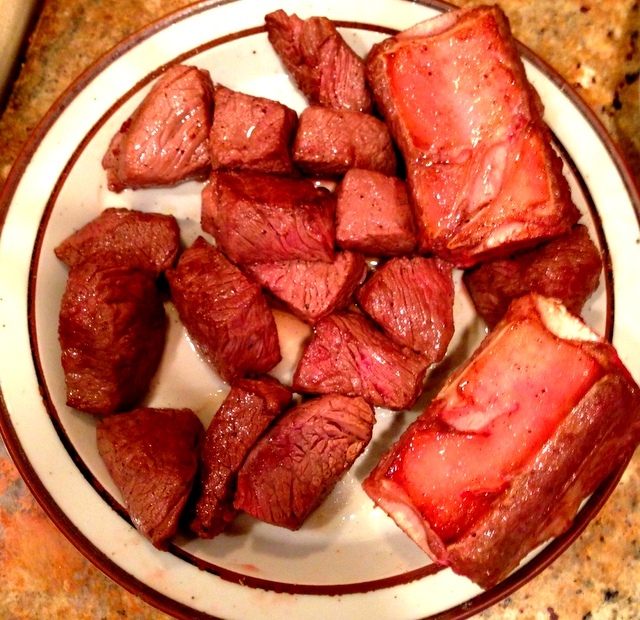 Add the meat back on top and stir. Add the soaked and drained beans on top of this and stir. Nestle the eggs evenly throughout the meat. Place the potatoes on top of everything else. Cover all ingredients with stock. If stock isn’t enough, add water to cover. Bring mixture to a slow boil, skimming the foam off the top as it forms. Add all the seasonings to the pot. Stir just enough to get the spices all over the broth. Sprinkle the barley on top, but make sure it sinks into the liquid. 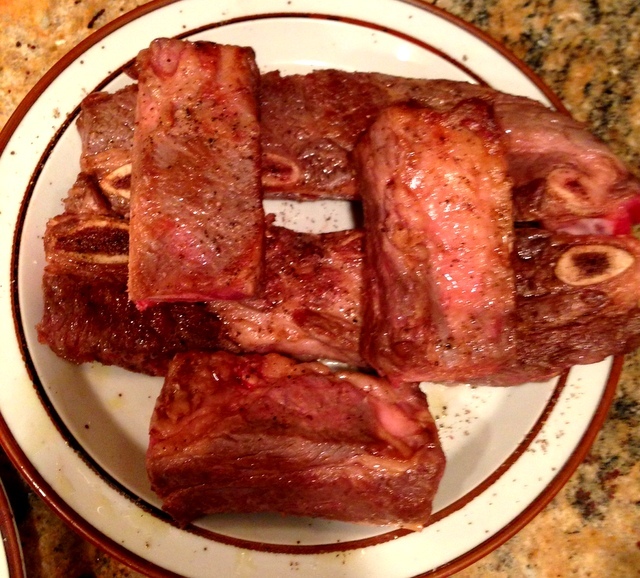 Transfer pot to the oven and cook for 8 – 15 hours. The liquid should reduce by about half. Don’t let the liquid level go beyond that. 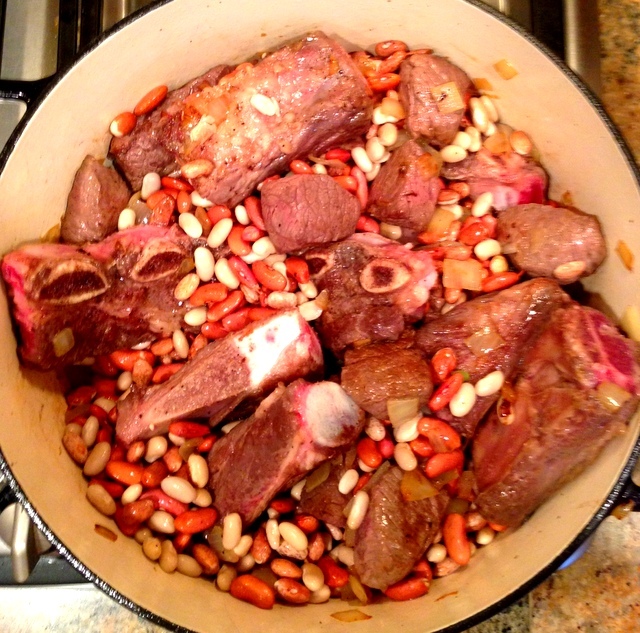 You don’t want a dry cholent. If necessary, add more water so half the pot is full of liquid. If you have the opposite problem and the liquid hasn’t reduced, uncover the pot for the last hour. This will allow some of the liquid to evaporate. 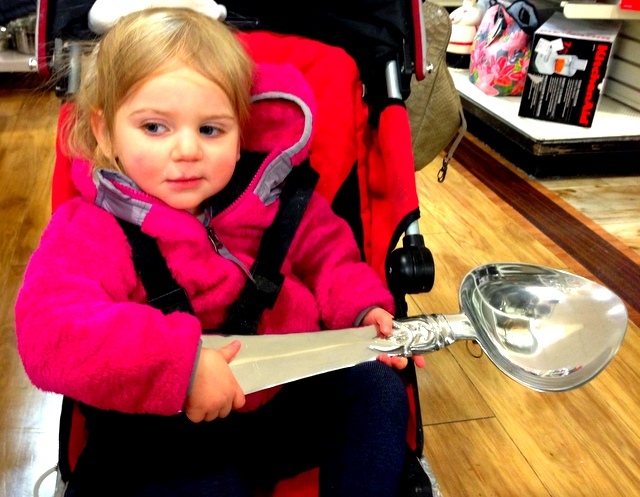 Anya: I finally found a spoon big enough for the cholent! Rinse beans in cold water. Put them in a large pot and cover with about 3 inches of cold water. 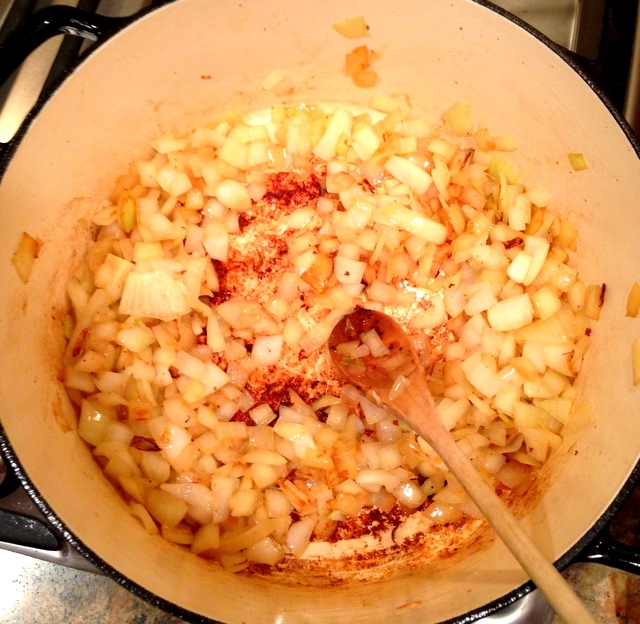 Bring almost to a boil (small bubbles appear around the edges of the pot), cover, and remove from heat. Let sit for 1 hour. Drain. The beans will be “soaked” and ready to cook. Hurricane Sandy and Her Aftermath: Halloween!